Better Painting & Coatings is proud to announce their partnership with Super Products International II, Inc (SPI). SPI manufactures Super Therm, a high performance “paint” engineered with the highest quality raw materials. Super Therm improves your property and stops our unpredictable weather from becoming an insurance claim. It brings you extra toughness and durability in an exterior/interior protective coating. It’s like putting a ski jacket on your house. Perfect for the color coat on stucco. Paint that can help you save money. Stay warmer in the winter and cooler in the summer. Super Therm works by not letting your property get overheated. It blocks up to 95% of the sun’s total energy and up to 99% of heat carying infrared light. An article in the June 2008 issue of Today’s Health magazine featured the Pandanzzo family. 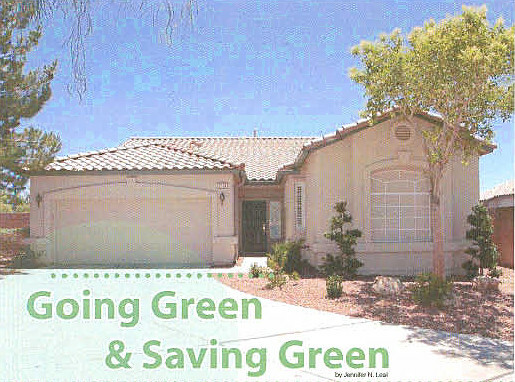 They saved $80/mo in utilities in their Las Vegas home using Super Therm and HSC coatings from SPI. 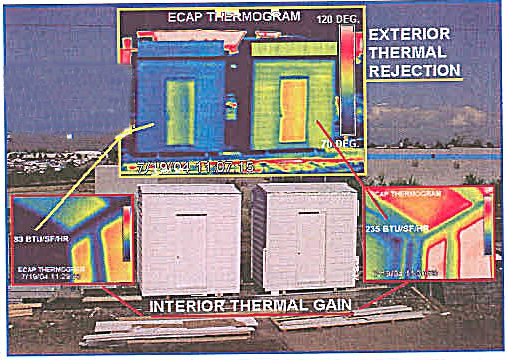 The building painted with Super Therm (left) showed a 30% reduction in energy use. Energy Star rated Super Therm with a 20 year life expectancy on horizontal surfaces. It will last longer on walls and replace one or two repaints, saving you thousands. The protective resin formula has also earned a UL and FM Class A fire rating, meaning it will not contribute to fire or smoke. Technically, it’s a water base 100% acrylic elastomeric urethane modified formula with low VOC’s. That means it stands up to 98mph wind driven rain for 24 hrs, reflects up to 99% of destructive UV light, has high impact and abrasion resistance and high adhesion. Super Therm lets water vapor out while keeping rain from getting in. It has been extensively tested and approved by 14 state, national or international organizations. In other words, it kicks typical paint to the curb. SPI has a 23 year track record of success across many industries and countries. They are an international company headquartered in Shawnee, KS. I am confident their products will be a good fit for our area. You owe it to yourself to see how you could benefit from a product of this quality that can lower your cost of living and increase weather protection. Getting started with a high performance home is just a click or call away. In my 11 years serving the Front Range, this is one of the best paint products I have found. My goal is to provide better looking longer lasting painting results for my clients through better prep work, products and application. Call 719.641.5043 today to experience the Better Painting differance!